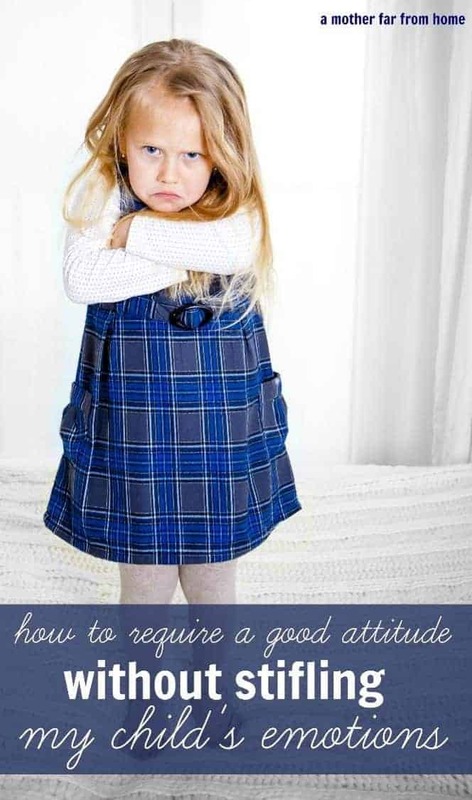 Can I require a good attitude without stifling my children's emotions? Can I require a good attitude without stifling my children’s emotions? There are some parents who say we should train our children to have positive attitudes and require it of them no matter what. There are other mothers who say that everyone has bad days, bad moods, and bad attitudes, and we shouldn’t stifle our children’s emotions by making them pretend to be happy when they aren’t. I think there’s a better (and easier) way. I believe we can train our children to behave with positive attitudes while still allowing them to express and release their honest emotions in a healthy way. In other words, you can have kids who behave well but aren’t repressed emotionally. Remember: emotions are neither positive nor negative, they are neutral. Happiness, sadness, anger, loneliness, jealousy or frustration happen involuntarily. We do, however, control our reactions and responses to our emotions, and this is where training becomes necessary. There is a window after experiencing a certain emotion where (to a certain extent, and not always in extreme cases like grief) we are able to decide if we want to savor or shun the emotion we’re feeling. It is during this period, when they are dealing with their involuntary emotions, we want to train our children to express themselves in a healthy and appropriate way. not be ruled by their emotions and moods. our decisions are dictated by their moods. we can require a positive attitude generally while still allowing them to feel their negative emotions. Our parents’ generation were masters at ignoring their emotions and getting on with it. Our grandparents generation (many of whom lived through the Great Depression) didn’t often have the luxury to wallow in their feelings and didn’t raise their children that way. Our generation wallows, self-pity Facebook posts, and still struggles to just get on with it. I think we can train our children to process their emotions in a healthy way while still being able to just buckle down and do what needs to be done. You are at the park, it’s time to go, and the kids don’t want to leave. They may take this opportunity to yell, scream, run way or become generally disagreeable in an attempt to embarrass you in public. The event: no matter what they want, it’s time to go. The emotion: anger, disappointment, sadness, etc. An unrealistic goal would be to expect them to jump down from the equipment and happily run to the car. A realistic goal is for your children to follow you to the car without pitching a fit or saying something ugly. A permissive goal in the name of “letting children be children” is allowing them to pitch a mighty fit, waiting a few minutes until it’s out of their system, then going to the car. Appropriate reactions on the part of your child will come as a result of continual training, not one off events. It’s normal that children don’t want to come home if they’re still having fun. As a parent, you can even understand this feeling right? What person of any age wants fun to end? You can allow them to tell you how they’re feeling, why they want to stay, why the park is so fun, the highlights of their time today, etc. as a way to help them process their feelings. Phrases such as “I know it’s hard to leave when we’re having so much fun, but it’s time to go home” or “I bet you really aren’t ready to go home, huh? Sorry that we have to go, but mommy has an appointment and we have to get in the car now.” Even that small amount of commiseration may be enough for your child to feel understood. There are times when my 3-year-old is overflowing with emotion that can’t be explained. I fear her teenage years if these outburst are any indication, which is why we’re starting early. When she is crying and fussing and just seems inexplicably sad, we have started to direct her to the sofa for some cry time. 99% of the time she’ll go to the couch for a few minutes, snuggle in the pillows and cry, then jump up and explain “Now, I’m all better!” and genuinely be in a better mood. I don’t think you should let one child begin to scream in frustration in front of everyone else because it is disturbing to the other children, never mind how screaming will grate on your own nerves. If your child feels angry or highly frustrated, why not send them outside, to their room, or for a good jump on the trampoline. Find a safe place (and by safe place, I mean somewhere they can feel free to release their emotions) where they can let loose. They can throw sticks in the woods, punch a pillow, or sit in the closet for a good weep. Each situation may be different, but if you can see your child needs to let loose, help them find a safe and appropriate place to do so. There are times when you need to hear your child’s emotions or “side of the story” and there are times when it will do no good. Using Val’s example from earlier in the week, if your house rule is no throwing the Nintendo remote, and one child throws it, the punishment is no Nintendo. Period. Your child will probably feel a myriad of emotions resulting from this consequence, but having a long drawn out conversation where they express their thoughts at injustice, unfairness, and poor pitiful me will not accomplish anything. In this case, they broke the rule they face the consequence. Their emotions are best expressed alone and elsewhere. There’s no need to argue about whether it’s time to leave the park. It is. A face-to-face will not change that. However, there will be times when you need to hear your child’s heart, and perhaps even change your mind. Was it a sibling issue, an unfair punishment at school, an emotional wound from their group of friends, etc. When your child is suffering, it’s good to help them open up. Listen without interrupting. Don’t try to justify their childlike emotions since they are, after all, children. Children feel things deeply and a mother’s understanding will act as a salve. 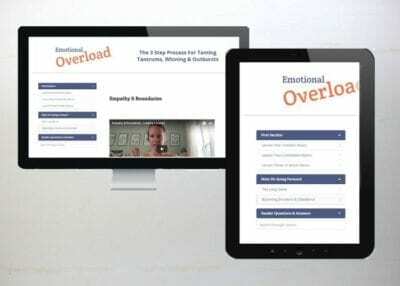 If your children are feeling overwhelmed with their emotions, you can require them to act calmly and respectfully to you, and then suggest an outlet for their frustrations. Painting, drawing, writing, or coloring are good ways for your child to put on paper what they are feeling. You are probably thinking it seems a little cheesy, but forget about that. You don’t have to look at or read what they’ve done if they are feeling private, but creativity and art is used as a healing therapy in many situations so offer your child this opportunity. My son likes to throw things when he gets ticked off. For boys, a physical activity may help them release some steam. You should require their obedience and respect, but it’s okay to let them go outside and hit a tree with a stick, kick a soccer ball, or punch a punching bag. As long as they are not destroying property or vandalizing something, why not let them get it out? If we want our boys to grow into emotionally healthy men who are not distant, emotionally unavailable, or completely dependent mama’s boys, we must give them opportunity to express themselves now. One surprising way of eliciting good attitudes when children are tempted to misbehave and meltdown is to truly empathize with their situation. If you turn off a cartoon halfway through, what did you expect? Would you like your husband to turn off your show halfway through? Unless you have to, why not wait until the end of the show? Of course you want your children to respond to you appropriately any time, but there’s no need to push them to the limits of their self-control. Use phrases like “I know it’s so hard to do this….” or “You are behaving so well even tough I know you aren’t very happy right now...” Your child knows they have to obey you, but this empathy helps to soften the blow for them. Give them advanced warning as well. Twenty minutes, ten minutes, five minutes until we leave. This prepares them for leaving and meltdowns and freak outs are generally minimal if they’re prepared. Once they are calm, let them tell you why they get frustrated and let them know that you completely understand. Sometimes we just have to do what we have to do, but that doesn’t mean we like it! Kids will respond to that. Don’t let your children scream in your face. Don’t let them say bad words, cruel insults, or physically abuse their siblings in the name of emotional expression. You can require respect, a positive attitude (or a neutral one in dicey situations, at minimum), and obedience. But know that your child may carry through with your instructions and still have emotions bubbling away under the surface. Ignoring your child’s true (involuntary) feelings will only lead to resentment, distance, and difficulty maintaining a close mother/child relationship. When your child is old enough to express themselves without blowing up, let them. If they really need to tell you how they are feeling, let them. It’s better to maintain the mother/child relationship than “win” by refusing to let them say something negative in your presence. As always, it’s a respect balance. They respect your authority as a parent, and you respect their position as a young human being in your family. « What do we mean by attitude? That’s a great way to put it, Kate. Wanting them to be heard and feeling connected and not crushing their little spirits while still encouraging self-control and positive behavior. We can only do our best but I think just keeping that balance in our minds really goes a long way. I can tell that my daughter knows she has to do what I say yet feels comfortable being emotional with me. I can only hope it continues! Great ideas Rachel, I’ve been looking for a way to manage these types of behaviors in my afterschool program (K-4). With an average headcount of 43, we don’t have a lot of times to appropriately deal with tantrums and stinky attitudes. I love your no-nonsense approach. Is it ok to print this out and share it with my assistant teachers? Shay, what an honor that you would want to do that! Yes, please do! I think it’s an important topic. Important they get to express themselves and important they learn to do it in a healthy way. :) Thanks for stopping by! My question is how do I handle the disrespectful emotion? Often times when my 3 year old does not want to do one of her chores she will scream “Fine! But I’ll do it grumpy!” She then does the chore quickly and storms off. She is required to out her dish in the dishwasher after every meal and has for months, so it’s not like it’s out of the routine. Most times she does it no problem, but will randomly snap. Almost every morning we have some type of distrespectful screaming episode about something in her normal routine that she is not happy about. What would be the best consequence? Hi Rachel. I love your series and find it helpful. I’m wondering how old your children are now? Mine are a bit older at 10, 10 and 11 and our house is crazy! Do you think you’ll add and modify your series to fit older children?